Logistics News: Shipper Group Proposes New Rules to STB to Regulate Rail Carriage Through ''Reciprocal Switching'' Logistics News: Shipper Group Proposes New Rules to STB to Regulate Rail Carriage Through "Reciprocal Switching"
Logistics News: Shipper Group Proposes New Rules to STB to Regulate Rail Carriage Through "Reciprocal Switching"
Detailed Proposal for New Rules Likely to Be Successful, Experts Say, Forcing STB's Hand; New BNSF Option for Houston Chemical Makers Captive to UP? Last week, the National Industrial Transportation League (NIT League) filed a petition with the Surface Transportation Board (STB), the agency in charge of railroad regulation, to mandate a practice called "reciprocal switching," a form a competitive access that requires railroads to move cars from other carriers for a predetermined fee. This would provide one answer to the "captive shipper" problem the STB has been looking at for years and increase overall rail competition. That report from Christensen Associates noted that "reciprocal switching and terminal agreements were more likely to create favorable economic benefit/cost conditions than more sweeping access reforms." NIT League is a shipper-based organization formed more than 100 years ago. It says the petition is needed because current rules, written over 25 years ago, "require shippers to show that competitive abuse or serious inadequate service exists in order to obtain reciprocal switching. The end result is that the rules prescribed for reciprocal switching have set such high barriers that no shipper or receiver has been able to meet these standards." Of late, US rail carriers are doing very well financially - perhaps too well, once again drawing the attention of regulators. Last month, the STB held public hearings, for example, on the state of rail competition, during which NIT League says "contrasting views were presented by shippers and Class I rail carriers on whether changes were necessary in the Board’s competitive access rules that today govern the freight rail industry." 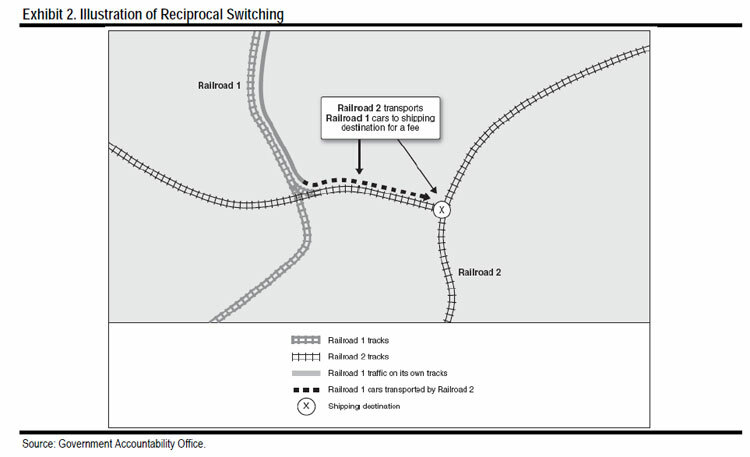 Reciprocal switching (see graphic below, from the Government Accountability Office)) is a practice where one carrier moves another carrier's cars on its tracks for a fee. While many carriers have such agreements in place now, the practice is not mandatory, and the fees for the move are lightly regulated. Canada currently has an interswitching program in place similar to the NIT League proposal, in which a shipper can request service from a secondary carrier if the second rail is within approximately 18 miles. Reciprocal switching is needed for "captive shippers" who have only one rail alternative. By in effect forcing one rail carrier to switch rail cars to another carrier's track at a reasonable fee, that shipper might then have another option that would bring more competition into the equation. Some studies have shown that captive shippers pay 20% more for equivalent rail transport than non-captive rail shippers. The 70-page proposal sent by NIT League to the STB makes a strong case for why new regulations are needed and actually provides the language of the proposed changes the group would like to see added to current regulations. The document was prepared by lawyers representing NIT League from the Washington DC firm of Thompson Hine LLP, who worked with NIT League's rail committee. The full petition can be found here: NIT League Reciprocal Switching Petition to the STB. The League’s petition requests that the STB eliminate the current criteria required for a Class I railroad to enter into a reciprocal switching agreement with another carrier in favor of new regulations that would require Class I rail carriers to enter into a competitive switching arrangement when several defined conditions are met by the shipper. • That the shipper’s/ receiver’s facility(ies) for which competitive switching is sought are served by only one Class I railroad. • That there is no effective inter- or intramodal competition for the movements for which competitive switching is sought (with no consideration of product or geographic competition). The League provides some formulas for calculating whether there is not effective competition, such as that the controlling Class I carrier has handled 75% or more of the freight volume transported for a movement for which competitive switching is sought. • That there “is or can be” a working interchange between a Class I rail carrier and another carrier within a “reasonable distance” of the shipper(s) facility(ies). Again, the League provides some proposed definitions of how this would be determined, such as facility(ies) are within a radius of 30 miles of an existing interchange at which cars are “regularly switched. However, the League’s petition also proposes that a competitive switching request would not be required be on either rail carrier if the railroad can establish that the proposed switching is not feasible or is unsafe, or that the presence of a competitive switching arrangement will unduly hamper the ability of either carrier to serve its shippers. Lastly, the proposal would allow shippers who cannot qualify based on the above rules to still petition the STB to force a competitive switching agreement. According to the transportation industry analysts at Wolfe Trahan, "the proposal from the NIT League applies further pressure to the STB by providing the clearest and most specific example of what shippers seek and a clear timeline for when the STB must respond." They added that they had spoken "with several lawyers who expect the STB to follow the NIT Leagues proposal and open up a rulemaking [session] to consider the possible changes." However, that would set off a somewhat lengthy process sure to include vigorous counter efforts from the railroads. Wolfe Trahan believes that would take at least a year if not longer, followed by another period of time to implement the changes. That also means it is possible the process could go past the 2012 elections, which might have the potential to change the climate in Congress and/or direction from the Whitehouse to the STB. Another question even if the STB eventually adopts the new rules is whether there will be a set fee schedule, or the rates would be determined on a case by case basis. Some studies, such as one the STB itself authorized in 2007, have found that reciprocal switching may be the most fair way to address the issues, versus other choices such as tightly regulated "bottleneck pricing." The NIT League petition notes the strong support for such changes by many others, including the US Department of Agriculture, 25 different shippers associations, and individual companies such as Dow Chemical, Dupont, PPG and other chemical industry firms. That is in part because reciprocal switching requirements could open up chemical companies in the Houston area that are now captive to Union Pacific to new service from Burlington Northern as well. What do you think of the NIT League proposal? Is it enough? How much of an impact on rates and service will it have? Can the railroads fight back? Let us know your thoughts at the Feedback button below.